I’m very grateful to be part of the launch team for Skye Jethani’s brand new book Immeasurable: Reflections on the Soul of Ministry in the Age of Church, Inc. As part of the launch team, I got this book for free in exchange for a fair review. I signed up on a whim; but I’m really glad I did. Immeasurable is a book I’d like to give every person just starting out in ministry. It is a much-needed antidote to the consumer-driven, success-by-the-numbers approach of a lot (if not most) of what passes as “Church leadership training” these days. Skye does a great job of distilling and applying some of the best ideas of the “giants” he thanks at the beginning of the book—guys like Eugene Peterson, Dallas Willard, Brennan Manning, and Henri Nouwin. If young pastors and new leaders start here, they’ll be on a virtual launch pad to much of the best literature out there on the essence of pastoral ministry, and they’ll be exposed to ideas and stories and will likely challenge them deeply. Skye casts a deeply inspiring vision of pastoral ministry that encouraged me think about “church growth” as something much deeper than attendance numbers or even theological education. Instead, Skye urges pastors and leaders to consider growth in terms of communion with Christ and empowerment of the laity to deeply pursue their own spiritual growth. According to Skye, Christian ministry must never be fully equated with mission, as vital as that is, but rather must retain real relationship with God as the ultimate end. This is so easily lost today when—as he reminds us—so many good things (like people in the pews and a passion for God’s mission in the world) become ultimate things. This book is nothing less than a guide on how to avoid the ever-present temptations of idolatry for ministers. Above all, Immeasurable reminds us that ministry can never be about control; like all of life, it must be about communion. A note on format of the book: it’s divided into 24 chapter that can each be read in about 20 minutes or less. Each chapter is more-or-less a self-contained essay on a different topic, ranging from the role of ambition in ministry, to preaching, to simplicity, to building influence and beyond. Each chapter has a few questions for reflection at the end. This format lends itself to serious reading and thought, and would be great to go through slowly with leadership teams. I could also see this being used for training programs for new leaders, with the questions being jump-off points for discussion with mentors. I like backpacks. It’s a weakness. I can often obsess over finding the perfect pack, and I own way more than I really need. Moreover, I gravitate toward the expensive ones. A little over a year ago I gave away two other daily carry type backpacks. Short on cash, but needing a way to haul gear around town during the day and around the country on short trips, I reluctantly started looking for something cheap. I saw the Timbuk2 Rogue Laptop Backpack on sale for $35 [edit: correction: $29], so I thought, why not take a chance…it’ll just hold me over until I get a better pack. Then I stashed it away and switched to small messenger bag (too small for my laptop). When I started having to carry around my laptop, I sold my messenger and I got the Rogue out of the closet. A year later, it’s still my daily driver. 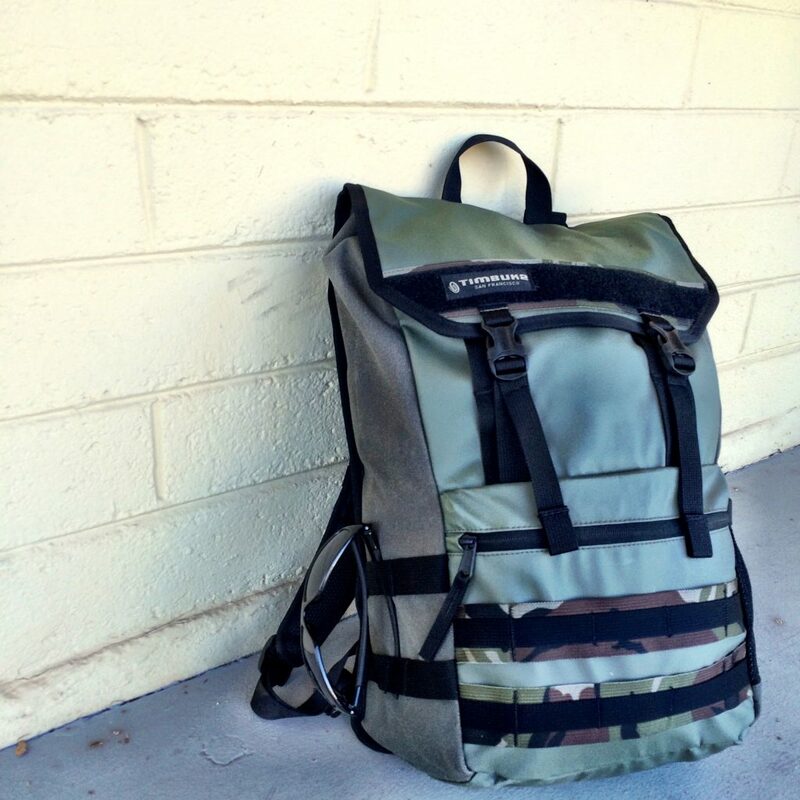 What makes the Timbuk2 Rogue Laptop Backpack so great? 1) Design. Sometimes, simpler is better. This is one of those times. The Rogue is top-loading pack with one main compartment and 3 additional pockets. The large main compartment is big enough to pack everything you need for the day with enough room to throw in some library books or a small sack of groceries later; it’s about 25 liters. The top flap is thoughtfully designed to keep water out via sides that tuck under (kind of hard to explain…) and fastens with a combination of velcro and sturdy buckles. 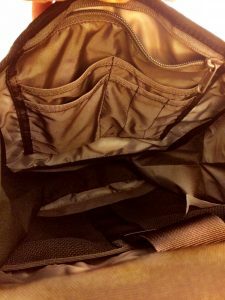 This style of opening allows for the bag to expand and contract a bit as needed (like a true rolltop, but less so) and provides a handy way to stow a light jacket under the straps. Inside the main compartment you’ll find a lightly padded laptop sleeve, a small zippered pocket toward the top along with an admin section for your writing utensils, business cards, etc. On the exterior of the pack there’s a nice small zippered pocket for quick access to cables, a small tablet or paperback. On one side there’s mesh water bottle holder that can hold most anything up to a liter in volume. The shoulder straps have the perfect amount of padding: enough to keep you comfortable with loads under 20lbs or so (hopefully you’re not carrying much more than that on the daily) but not so much as to be bulky. There’s fairly useless bottle-opener attached one shoulder strap. I’ve only used it once, but I suppose it could come in handy in a pinch. A simple webbing grab-handled is sewn to the top above the shoulder straps. Additional understated webbing on the front and side of the pack provide a place to lash on extra cargo, wet shoes, or whatever as needed. 2) Construction. This is my second Timbuk2 bag, and just like my other one it seems flawlessly constructed. There’s not a stitch out of place and all the materials seem high-quality and durable. I’ve had the pack over a year and carried it daily for almost 10 months. It still looks almost new. 3) Price. These are often on sale at Amazon, Newegg, etc for $75 and under. Like me, you could get even get lucky and find one under $50 if you’re not too picky about the color. I think this is probably one of the best values in backpacks out there, to be honest. 4) Other general awesomeness. Because of the way this pack is made, it looks great either full or empty. It collapses down nicely when not packed to the brim, so you won’t feel too weird when you’ve just your laptop and jacket. Even when packed full (and this pack can hold a lot!) it maintains a slim profile. Speaking of looks, I like that it retains pretty much all the function of most tacticool packs, while still maintaining a more sophisticated style. No, it’s not boardroom ready, but neither does it look like you’re heading out to hike the Grand Canyon. There’s nice velcro strip you can put patches on, if you like. I put an Arizona state flag patch on mine. It’s also a highly water-resistant pack. Top and front are basically waterproof material. The sides might let a little in if soaked, but if you find yourself caught in the rain your stuff should be fine for while you find shelter. 1) The velcro opening is a bit noisy. not at all an issue for me, but I could see how it could be annoying for some people. You could get silencers, if you wanted, and just use the buckles to close the pack. 2) It’s narrow pack. Some wider binders might not fit super well. I have one that I carry all the time and it has to go in diagonally. Standard letter size notebooks and file folders are fine. 3) The laptop sleeve is integrated into main compartment. When traveling, you’ll have to open the main section to get your laptop out when going through security. If you’ve packed it pretty full, it can be tough to get wiggle your laptop back in. For this reason only it’s not my preferred travel pack if I’ve got a laptop, but it’s not horrible or anything. 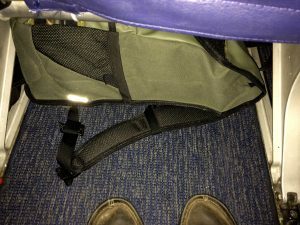 This pack isn’t quite big enough for trips longer than a couple nights, and it’s not the most TSA friendly design. All that said…After nearly a year carrying this bag every day, I’ve no immediate plans to replace it. If this one got lost I might even get another in a different color. It’s just a great all-around daily pack. Being forced to work with a less expensive pack has helped me realize that more expensive doesn’t always equal better. More than that, sometimes the best pack is the pack you already have. And even more than that, my life hasn’t change significantly since “downgrading” to less expensive daily carry bag. All good lessons for a gear junkie like me.